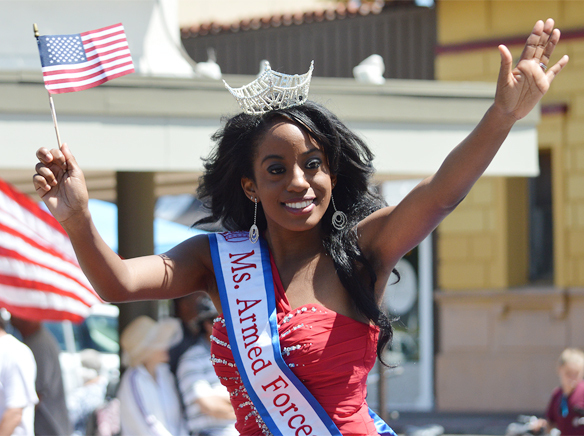 Red, white and blue filled the streets of La Mesa at the annual Flag Day Parade on May 31, with this year’s theme A Salute to Old Glory. Events began early in the day with pre-parade concerts in the square performed by La Mesa Middle School and Parkway Middle School Students in a musical venture in time of the nation’s most beloved patriotic songs. Beginning the parade was the U.S. 3rd Marine Aircraft Wing Band and its finale showcased the Living Flag procession by the First Class Petty Officers Association from the Tactical Training Group Pacific. People lined the streets early and young and old celebrated one of La Mesa’s most anticipated events and cheered the more than 85 entries throughout the parade as it proceeded down La Mesa Blvd. from Memorial Drive through the downtown village to City Hall.